An incredibly low priced 5-75 lb dumbbell set! This is a classic style of adjustable dumbbells, and the fancy competitors can't come close to this price. They are cheaper than the Bowflex, PowerBlock, or Ironmaster dumbbell sets of the same or weight. 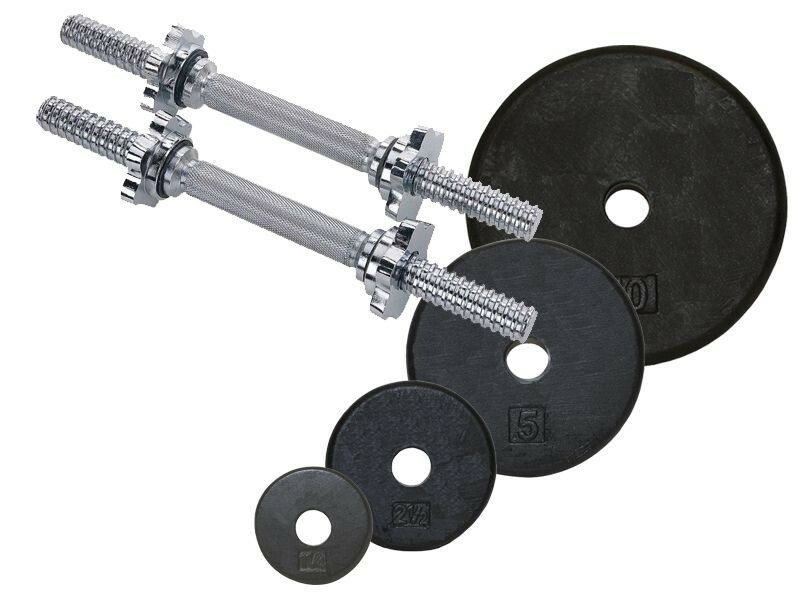 This set includes only 10-lb and smaller standard weight plates, because larger plates than 10 lb become too unwieldy for dumbbells. You can load each dumbbell up to 75 lbs with this setup. Note that you're actually getting MORE weight than 150 lbs (75 lbs per hand) because we provide enough 2.5lb and 1.25lb plates for small adjustments under 75 lbs. You will only be able to fit up to 75 lbs per hand because of the space available on the handles. These are solid steel dumbbell handles weighing 5 lbs each, not the easily-breakable hollow pipe version found at department stores that only weigh about a pound each. These pancake shaped black weight plates are machined completely around the outside edge, leaving a smooth, round edge that's safe for the user and floor. They will fit on any bar or dumbbells handle that is 1" diameter. The weight plates are coated with a durable satin black enamel paint and baked for one hour to assure a finish that is chip and corrosion resistant. Also see our article on the best adjustable dumbbells where we review this and other models.